Having a party within a 75 mile radius of Gloucester, Cheltenham or Worcester? 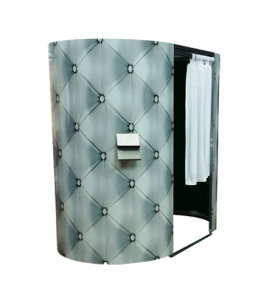 Hire one of our fantastic photo booths! Capture the fun of your special occasion . . .
Special offer: Book a 3-hour hire and receive a free set of duplicate prints, a free photo album and free green screen backgrounds. Let us entertain your guests and provide you with a special keepsake of the photo booth fun you are bound to have with your family and friends. Whatever your celebration make it one to remember! Free duplicate prints, free photo album and free green screen backgrounds with a 3-hour hire. Let us entertain your guests and provide you with a special keepsake of the photo booth fun you are bound to have with family, friends and colleagues. 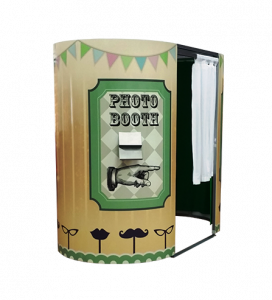 Hire a professional customised photo booth to promote your corporate image and tailor your parties and staff recognition events. Let us entertain your guests and provide you with a special keepsake of the photo booth fun you are bound to have. Our corporate package can be tailored to your specific requirements and includes the items shown above. We would be pleased to hear from you to discuss your event. Who are Party Foto Pods? 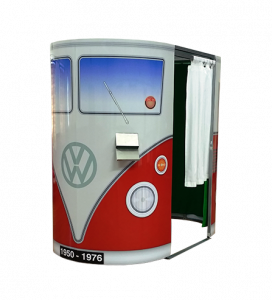 In 2015, as the new concept of photo booths was appearing on the wedding and party scene left and right and centre, Frankie and Ray decided to create Party Foto Pods to offer an exciting, up market and personal service to brides and grooms, party planners and corporate customers who are looking for that something special and attention to detail. and guaranteed satisfaction to grace their special events. They decided to stand out from the crowd and offer their new service to customers looking for that little extra. Personal service became their business model. By 2016, Party Foto Pods had become known and trusted by many valued customers. They soon became regular exhibitors at beautiful venues, such as Ellenborough Park Hotel, Dumbleton Hall Hotel, Upcote barns and Kingscote Barn to name but a few. The excellent reviews on Google and Facebook were giving customers the assurance that they would be using the services of a trusted company. As photo booths companies were coming and going, Party Foto Pods were going from strength to strength continuing with the personal service and being nominated for the wedding supplier of the year award. Customers ask why Frankie and Ray don’t grow their business and employ booth attendants rather than operating the booths themselves, but they know this is where the personal service would begin to be lost. Big isn’t always beautiful! Party Foto Pods is already a success story and Frankie and Ray know that their fabulous customers are more than happy with the service offered as the company steadily develops year on year. 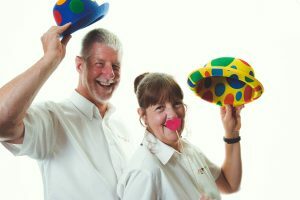 Today, Frankie and Ray are still passionately dedicated to their customers who entrust them with bringing fabulous entertainment and fun to their weddings, parties and corporate events as they ever were. They strive to make every event look special and personal by adding the care they know so many customers seek. If you are a bride, groom, party planner, corporate event organiser or an individual looking to plan a special party, Frankie and Ray at Party Foto Pods would be delighted to help bring fun and great entertainment to your special event. Party Foto Pods are based in Gloucestershire, but also cover all surrounding counties. 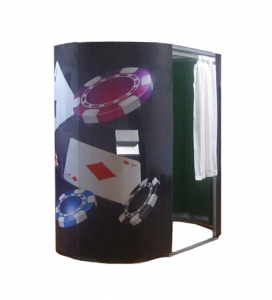 There is a great selection of booth designs suitable for all occasions. Please see ‘Our booths’ page. Your prints and the 9 ‘green screen’ backgrounds we use at every party will be tailored to your specific requirements for that personal touch and there is always a huge range of silly props to maximise the fun! Your photo booth hire will include 3 hours hire with unlimited visits to the booth, two copies of every print, where appropriate, free green screen backgrounds, a guest book where appropriate, a USB stick containing all high-resolution images and upload to Facebook (where required). Frankie and Ray will also be on hand to ensure that everything runs smoothly. Of course, additional hours hire and key rings for your guests are always available. Whatever your special occasion, a photo booth from Party Foto Pods is guaranteed to liven things up, create an exciting talking point, capture the fun of your party and provide you with fantastic memories to be treasured for years to come. Book Party Foto Pods now to help you celebrate your event and see how much fun you can have! I can't even begin to explain what a hit the photo booth was at our wedding! Everyone was heading for the booth all night for multiple tries at some funny pictures. The fact they could leave us a copy and a message in a book as well as taking their own copy home made everyone very happy. The team running the booth were so friendly and welcoming that they felt like part of our guest list. Thanks guys, ill be in touch for our Xmas party! Thank you so much for the excellent photo booth. As the photos showcase we and all our guests had a huge amount of fun posing. The album is amazing and a lasting memory of a fantastic night. The service and patience and friendliness of you both on the night was super. Highly recommend you to anyone planning their wedding.